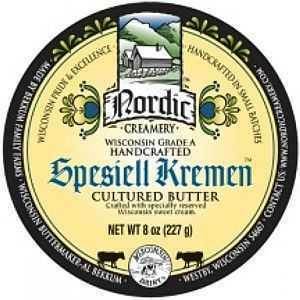 Spesiell Kremen is an unsalted cultured butter, made the same as our Cultured Butter with Sea Salt, except we do not add salt. Gold Medal winner at the 2017 US Championship Cheese Contest.You get the same creamy richness, but in a low sodium version. Spesiell Kremen is perfect for bakers who want an incredibly rich butter, but need to control the exact amount of salt going into their recipes. Moisture is super low. In fact when it's cold you literally peel it rather than slice it. This stuff is Legitimate! Service Area: Westby, Onalaska, Richland Center, Holmen, West Salem, Milwaukee, Madison, Appleton, Fond Du Lac, Rhinelander, Wisconsin Rapids and surrounding communities.